The weekend estimates are in, and surprisingly enough The Smurfs has tied with Cowboys and Aliens for first place. Industry analysts were projecting a $28 million take for the latest family film, so this is something of a pleasant shock for Sony, who is surely prepping their “#1 Movie in America!” ads as I type. The unpleasant shock goes to Universal, the studio distributing Cowboys and Aliens, who were hoping for at least a $40 million haul. While not terrible, it’s clear that marketing never quite connected with audiences, and the silly title didn’t help any. Crazy, Stupid, Love performed just above expectations and fulfilled requirements for a nice little counter programmer in similar vein of 500 Days of Summer and Eat. Pray. Love. I haven’t seen it yet but I’ve heard nothing but good things, so positive buzz will help its legs. Captain America fell a harsh 61% this weekend, but it’s been doing well on weekdays this past week, maintaining buzz and negative word on Cowboys (see my review here) will help Captain whether the storm and pull ahead. Harry Potter reached $300 million this weekend state-side and $1 billion worldwide, Warner Bros is surely pleased, particularly with their Dark Knight Rises trailer being shown in front of that many people. 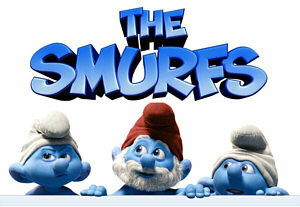 Comments for Weekend Box Office: Smurfs and Aliens Tie For Number One are now closed.